The word וּזְכַרְתֶּם–(you pl.) remember–relates the principle that when one sees the Tzitzit one will remember all the commandments of YHWH in order that all these commandments will be kept. The remembering is not related to any specific commandment, and encompasses all of the Torah based on a specific case-by-case basis in everyone’s life. The Tzitzit goes everywhere with the person, constantly reminding them to keep proper conduct with their fellow man, and with God. The Tzitzit surrounds the person from all corners, enveloping the person in the commandment and assuring that they are seen at every junction in life. However, remembering does not end there. The Tzitzit is also a mark of being chosen, and walking with them is an external symbol of being part of the chosen people. 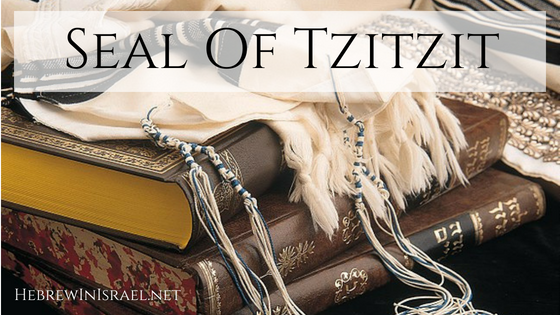 When one sees the external sign of the Tzitzit being worn by a member of the group, there is an expectancy that the one wearing them will conduct themselves in a proper manner based on all of the Torah. Wearing Tzitzit alone without keeping the rest of the Torah is shameful because it is connected to all of the Torah and does not stand alone. Hence one can say that wearing Tzitzit is YHWH’s seal of approval which cannot be abused. In many iconographic representations of Gods and kings in the ancient near east, it can be observed that all members of high level persons in these images wore different types of fringes. The most common and famous ones are the long cords with a flower at the end found in Assyrian and Babylonian art. God’s and kings all wear these cords attached to four sides of their garments symbolizing their status. However, it is well known that many people would have fringes and cords at the end of their garments, and these cords/fringes were part of common style of clothing, but also were a personal identification of the person used for sealing documents at a time where writing was uncommon and a simple but personal item had to be used as a signature. Evidence of Tzitzit being a seal can be found in the ancient near east. Tzitzit was used as a way of marking document by pressing the fringes of a garment to clay. The fringes were unique to the specific person because most clothing was made at home, and would carry artistic components made by the specific household. When a document had to be authenticated, all that was needed was to compare the fringes to the impression on the clay. By marking the clay with the fringes, the person doing so is placing personal responsibility to their commitment to the document. Symbolically, when someone is wearing Tzitzit they are placing a seal on themselves marking their commitment to YHWH and his Torah. The blue in question is known as “royal blue”, and in the higher end of the product quality its value was equal to gold. The most expensive version of blue was manufactured in Cypress by the Phoenicians from the Murex mollusk. This type of blue was even used to pay taxes, and kings stored them in their treasuries. However, we also know that cheaper, plant based versions of blue were available in the ancient world, as was discovered in Israel. The quality of the product is not the issue, but what it symbolized. Blue was seen as a royal colour, and when someone used it, it symbolized their status in the community. The Torah sees Israel as YHWH’s chosen royal people, and commands them to wear blue the same way the priests wear blue in their garments. By doing so, Leviticus, and associated parts of the Torah, are expressing the holiness principle common in the book where Israel is expected to live a holy life based on semi-temple-like life outside of the temple/Mishkan. Israel is seen as a “Kingdom of priests” without being actual priests, or serving at the temple. This idea is expressed by giving smaller versions of temple principles in everyday life, bringing the temple and YHWH’s presence in many parts of life. By the time of the end of the 2nd temple most people understood that the blue has to come from the Murex mollusk. Because the Romans under emperor Justinian I declared by law that no one except for the emperor could wear the blue, it became difficult to obtain the dye. “1. The Emperors Gratian, Valentinian, and Theodosius to Faustus, Count of the Sacred Largesses. Later in time the industry died due to the decline of the Mediterranean world and the move away from the ocean during the 8-9th centuries. Though there are other dyes in the world, only the expensive dye was considered acceptable, and any other dye was considered incorrect and a violation of the biblical law (Babylonian Talmud Menachot 40a). One can argue against this stance on the dye, but most Jews believe that the reappearance of the blue is connected to the messiah, an idea which probably originated somewhere during the early middle-ages. Because the practice has been not to use blue, it is taking time for blue to reappear in use. In the image: a clay document with a fringe and fingernail impression authenticating the document. Taken at the Bible Land Museum, Jerusalem by Yoel Halevi. Title graphic photo found Here. Do you think someone who is not Jewish, but tries to keep Torah with the best of his abilities, can use Tzitzit? If one is intending to be loyal to the covenant to its fullest meaning, then the answer is yes. However, if the person is interested in symbolic self identification, then I would say no. I’m not officially convert to Judaism, but I intend to do the conversion as soon as I can live in a place which is more “Jewish”, so to speak. Because I live in a small town where there is no synagogue, no kosher food (with a kosher stamp), and simillar difficulties. Do you think I fit in the first group? I would say that because you intend to show full loyalty you are in the first group. I have a similar question as Ana. Is it considered disrespectful to wear Tzitzit if a person is not of Isreal and female? Hi! Great info! I noticed in the photo it says “Seal Substitutes Fingernail and the Fringe” Out of curiosity, how is a fingernail used as a seal substitute? Thanks! When someone wanted to “sign” a clay document, they had several options- using their official seal/stamp if they had one, their fringes from the garment or pressing their fingernail into the clay.